With only 18 days away, I think we should start getting excited. I predict a Revival opener. What do you all think? I actually have no clue, but I'll guess "Don't Want You No More" > "It's Not My Cross to Bear" or "Mountain Jam"
Phil Lesh . . . This sounds about right. The intro jam at the penultimate show in 9-07 at Piedmont Pk was sort of a Green Onions-Dimples mix. I liked it; hope they work on it some more. Wouldn't it be cool if they redid songs in sequence to their first album for the first set. 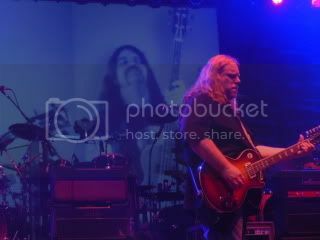 Besides a Mountain Jam opener, this is my favorite start to an Allman Brothers Band show. I always liked "You Don't Love Me" as an opening song. It just doesnt matter as long as my cinderella is next to me.they coud play mary had a lil lamb..But i predict the theme from Welcome back kotter..........WELCOME BACK!!! !